Anyone who claims to know for sure who’s ahead in the closely contested presidential race — pollsters and pundits included — is stretching the truth. After President Barack Obama’s lackluster performance in the first debate Oct. 3 in Denver, challenger Mitt Romney surged in the polls. In a mere three weeks in October, Obama’s comfortable margins in national polls — including a double-digit lead in the key battleground state of Ohio — dwindled to a virtual tie, with Romney now edging ahead in some of the national polls and deadlocked with Obama in Ohio. If Romney wins, the formula I developed to predict the winner in presidential elections prior to Super Tuesday will fail for the first time ever. 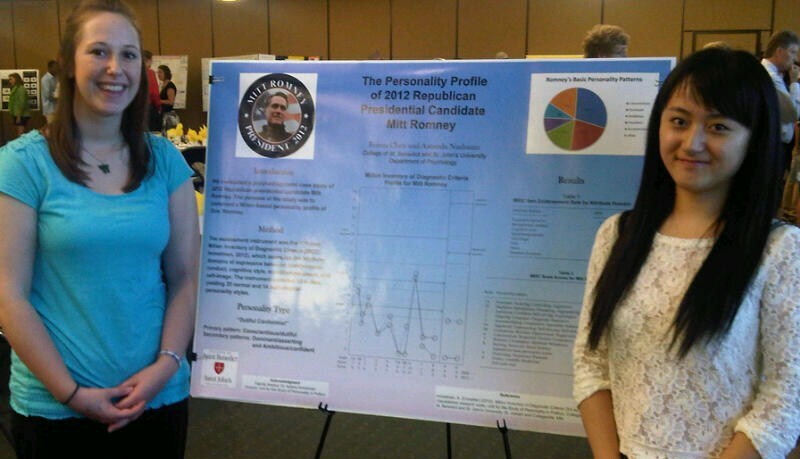 The heuristic model, developed in the Unit for the Study of Personality in Politics at St. John’s University and the College of St. Benedict almost two decades ago, employs candidate personality traits, as publicly perceived, to predict which contender will resonate most favorably with independent voters who base their choice on the candidate’s personal qualities rather than party political affiliation. The model works, because the nation is so evenly divided among partisan Republicans and Democrats, essentially yielding the balance of power to political independents and low-information voters. My research into the psychology of politics, spanning a quarter century, reveals that voters respond favorably to candidates that are outgoing, self-confident, and dominant; and negatively to candidates that are introverted and overly conscientious. Take Bill Clinton, the top-ranked candidate on my “Personal Electability Index.” Clinton is among the most outgoing, engaging, gregarious personalities I have studied; he thrives on the exhilaration of retail politics, and it shows. Not only that, but he brims with confidence, is socially poised, and has an ego that can fill a room – rolling with the punches and flourishing amid the cut and thrust of high-stakes politics. On social dominance, Clinton scores more modestly, but what he lacks in toughness he makes up for with the thickness of his skin. As for traits that play poorly in politics — introversion and conscientiousness — Clinton barely registers on the personality scale. Not so for Al Gore, the lowest-ranking candidate on the personality index. His conscientiousness is off the charts, with painstaking meticulousness, obsessive attention to detail, and an at-times self-righteous certitude. Although some of these traits are admirable qualities in a president, on the campaign trail they feed public perception of the candidate as stiff and formal, pedantic and boring. Moreover, Gore is among the most introverted major-party nominees since Richard Nixon. Introversion can be an asset in the Oval Office, permitting sustained focus, freedom from the shackles of the need to please, and a calm, placid, “no-drama” demeanor. But to voters, excessive introversion comes across as unempathic aloofness — a “wooden” quality that in its most ingrained form makes the candidate seem almost “robotic” — deficient in emotional expressiveness and spontaneity, and seemingly apathetic, with an unexcited, lifeless quality. Of the three personal qualities that appeal to voters — extroversion, self-confidence and dominance — Obama trumps Romney on the first two traits, while the third one is a wash.
On the two attributes that diminish the personal attractiveness of candidates in the eyes of voters, neither Romney nor Obama is notably encumbered by introversion, but Romney raises the roof on conscientiousness, which on the campaign trail blows down the house. In the end, Obama wins on points. Does personality matter? You decide. Personality is remarkably stable after the fourth decade of life. Nonetheless, more out of curiosity than for any pressing purpose, I collected additional personality data on Obama this summer, limited to his term in office. I was startled to discover that his electability score had dropped from 28 to 10 since his 2008 campaign. Although that number is still marginally higher than Romney’s, a score of similar magnitude in 2008 would have portended a McCain victory in my predictive model. Something happened. The person America elected in 2008, infused with hope and the promise of change, emerged as a changed man from the Rose Garden in 2012 to defend his title as the world’s most powerful leader. This is the opinion of Aubrey Immelman, a political psychologist who specializes in the psychological assessment of presidential candidates. 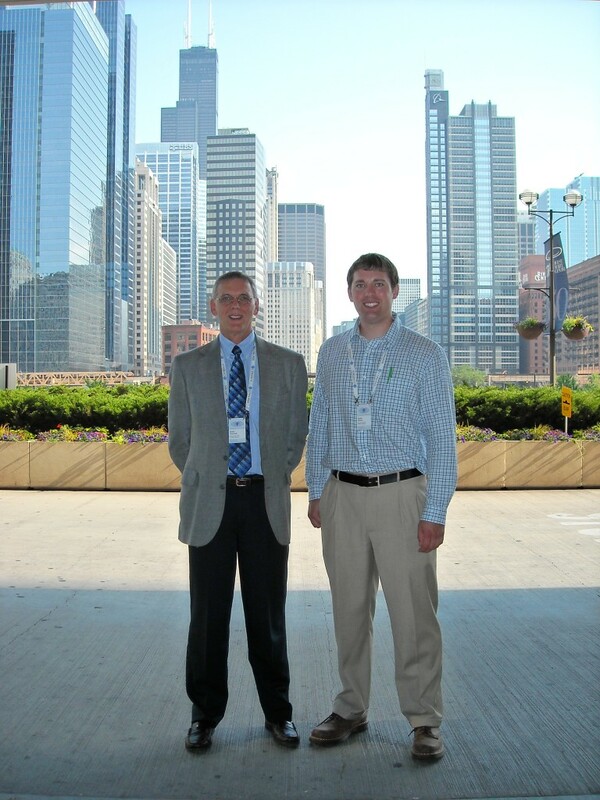 He also was a candidate in the U.S. House 6th District Republican primary. His leadership profiles of Mitt Romney and Barack Obama were published in the Aug. 30 and Sept. 8 Times editions. As shown in the pie chart above, Obama is primarily an Ambitious-confident personality, complemented by secondary Accommodating-cooperative, Conscientious-respectful, and Retiring-reserved features. 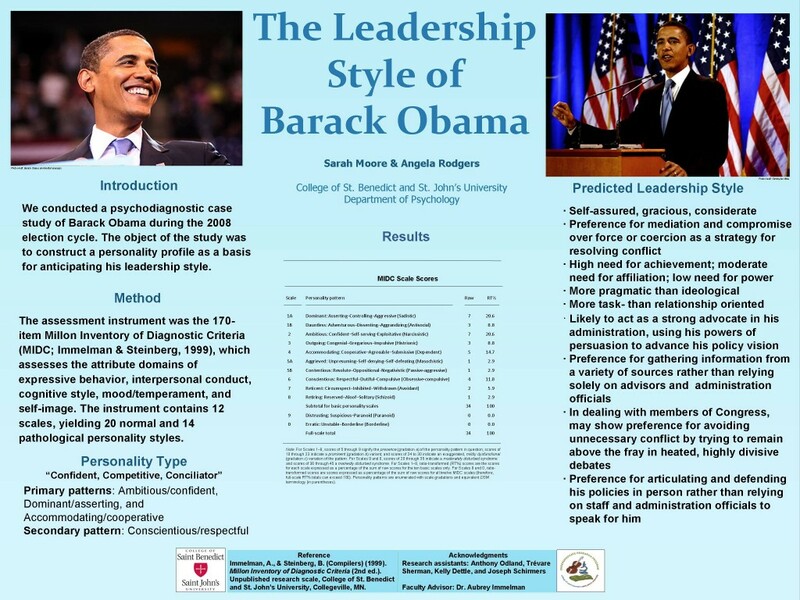 Obama’s personality profile provides a stable framework for anticipating his likely leadership style as president if reelected. 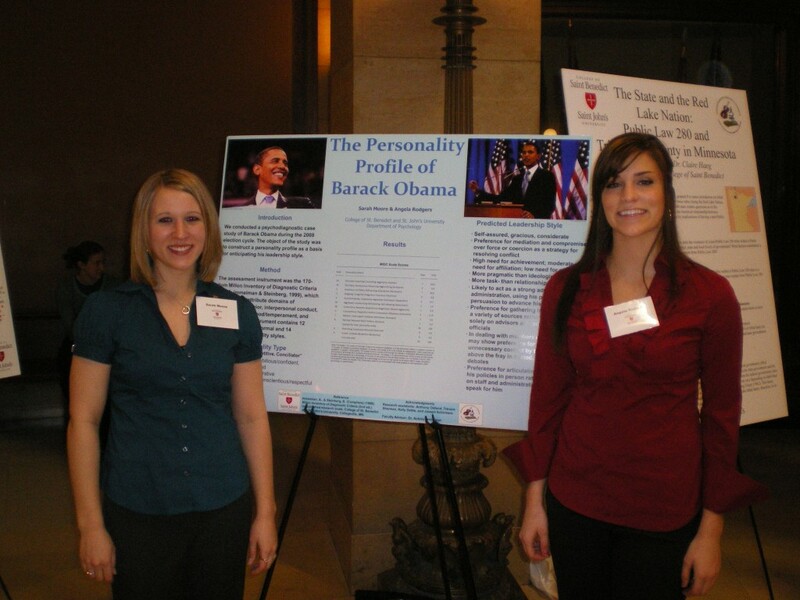 Research assistants Sarah Moore and Angela Rodgers presented their research on “The Personality Profile of President Barack Obama: Leadership Implications” at the 6th annual Minnesota Private Colleges Scholars at the Capitol event in the State Capitol rotunda, St. Paul, Minn., Feb. 19, 2009. A psychological profile of former Massachusetts governor Mitt Romney, developed at the Unit for the Study of Personality in Politics during Romney’s 2008 and 2012 presidential campaigns, reveals that the Republican nominee is highly conscientious, with a personality type best described as a dutiful conformist. 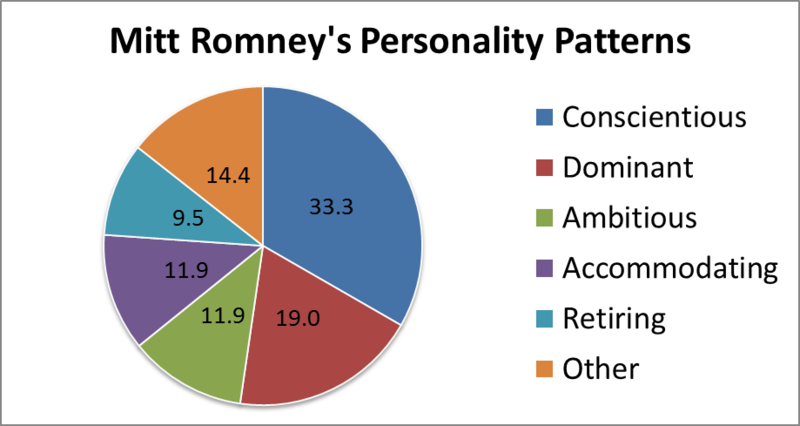 As shown in the pie chart above, Romney is primarily a Conscientious-dutiful personality, complemented by secondary Dominant-asserting, Ambitious-confident, and Accommodating-cooperative features and a minor Retiring-reserved tendency. 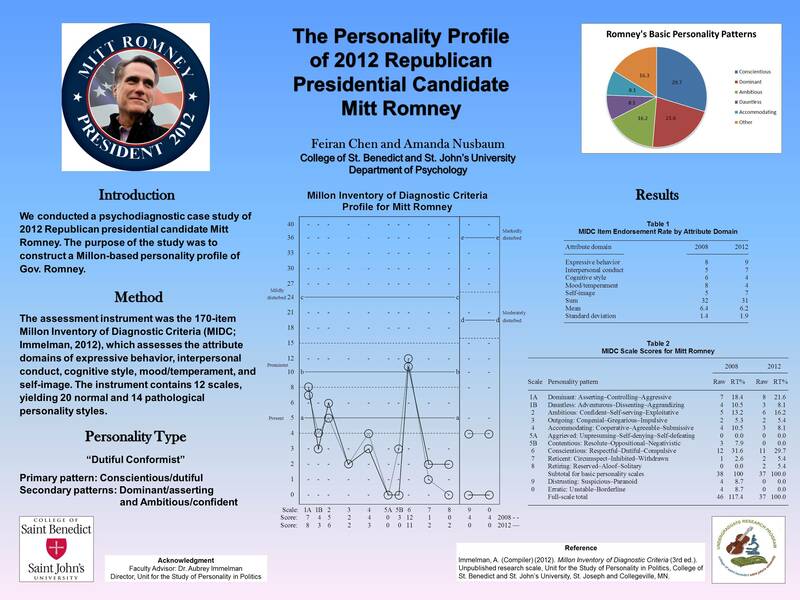 Romney’s personality profile provides a stable framework for anticipating his likely leadership style as president, if elected. The election forecasts are in fact predictions, based on various and varied statistical models. Most give the advantage to the president, but the verdict is not unanimous. WASHINGTON — Fluctuating polls aren’t the only way to predict an election. Thirteen different models published in the October issue of Political Science and Politics (PS) give incumbent President Obama the win — but just barely. The forecasts, which show the election to be much closer than the 2004 or 2008 elections, give Obama an average .06 percent lead ahead of Romney. This is the third election year the models have been collected into PS. In 2004 and 2008, a majority of the models correctly predicted the elections of George W. Bush and Obama. This year, there’s less agreement. Of the 13 models, five predict Romney, five predict Obama, and three are toss-ups. Because each model uses different factors in predicting the election, the results of each model are not the same. In nearly every report, changes in the economy played a role. Some forecasts used direct numbers from the economy, while others examined how the electorate has reacted to changes in the economy. Other factors included popularity of the current president, jobs and current polls. When each forecast is taken individually, the highest Obama can get is 53.8 percent of the vote, and the lowest he can get is 46.9 percent. When creating the models, professors seek to predict the correct winner rather than picking their favorite candidate, Campbell said. 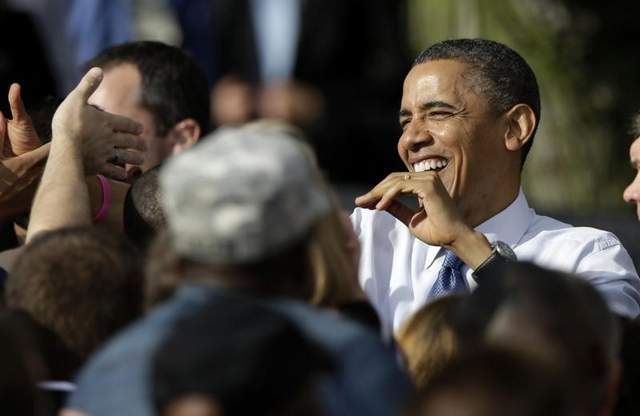 Although he is a Republican, Campbell predicts Obama will win with about 52 percent of the popular vote. He predicted Clinton’s victories in 1992 and 1996. He added that he wasn’t very happy to predict Clinton – save the fact that he was right. Thomas M. Holbrook, chair of the department of political science at the University of Wisconsin, correctly predicted George W. Bush and Obama’s wins in 2004 and 2008. Using a model that examines presidential approval ratings and personal finances of the electorate, he predicts a Romney victory. Holbrook acknowledges that Obama was leading the polls for a while and was even being declared the victor by some groups. But according to the model, it just meant some event – in this case the first debate – would even things out. Reach reporter Emily Wilkins at emily.wilkins@shns.com or 202-326-9867. SHFWire stories are free to any news organization that gives the reporter a byline and credits the SHFWire. Historically, when the need has arisen to change behavior, political leaders have turned to economists. That’s one reason why presidents have a Council of Economic Advisers. When economists speak, presidents listen. And when economists have the president’s ear, all their whispers are predicated on a set of assumptions about human behavior. … They will for example argue that people are motivated by self-interest and are rational calculators of their interests, and that the most effective way to get people to change the way they behave is by creating the right material incentives. Now, people are sometimes rational calculators, but often they are not. And self-interest and incentives certainly matter, but they aren’t all that matters. The perspective of economists is importantly incomplete, sometimes even misguided. “And now, in 2012, after President Obama revived Mitt Romney’s moribund campaign by inexcusably phoning it in during the first presidential debate, it looks like another unexpected and unpredictable example of the Teddy White Rule may have boosted Obama’s chances less than 100 hours before Tuesday’s election. A heuristic model I developed at the Unit for the Study of Personality in Politics to predict the winner of the presidential election prior to Super Tuesday indicates that Democratic incumbent President Barack Obama will defeat Republican challenger Gov. Mitt Romney in the 2012 U.S. presidential election. Of course, no model is 100% accurate, but my Personal Electability Index has accurately predicted the outcome of every presidential election since its inception in 1996, more than six months prior to the election date.